Are you tired? Run down? Listless? Food can help! 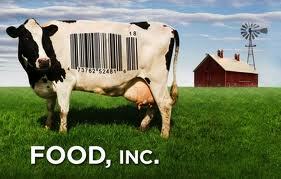 This movie is a “must-see” for anyone concerned with what we are actually ingesting on a day to day basis. I LOVE this film!!! It raises awareness without going to the extremes that P.E.T.A. does and it doesn’t get super gory or horrifying. But it does tell the story of how our food is processed and the history behind it. It also inspirational because along with showing the commercially prepared food, it also shows community farmers raising animals the proper way for food. My husband and I didn’t eat any meat for a period of 3 months last year. We felt GREAT but man, sometimes you just want a steak! So it was inspiring to see farmers raising animals the way God intended it. No chemicals. No hormones. No AMMONIA (yes, Ammonia!). There is even a lot of quotes at the end of the movie that try to motivate the viewers to take a couple of small steps in the right direction, like planting a garden, etc. I don’t want to talk too much about my views regarding the film because I’d like to leave room for personal impact, but I will just say that it is an awesome documentary filled with insight and hope. AND I am excited to say that this past week I actually purchased our first share of meats & eggs from a local farmer here in the Nashville area. If you live around here, you should definitely check them out at www.rollinghillsfarm.com. We didn’t have the time to visit the farm this weekend but I am hoping to make the trip in the next couple of weeks. I get to pick up my share of meat on Thursday and I couldn’t be more excited! I am blessed because my husband is equally as excited. He was joking about wishing we had some fabric or vegetables that we could use to exchange for the meat. That would REALLY be getting back to our roots. But for now, we will just stick with paying cash.